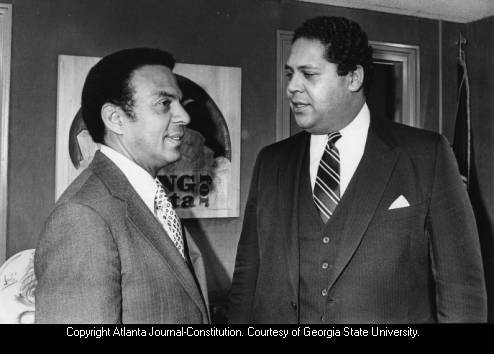 Andrew Young speaks with Maynard Jackson, March 8, 1982. The Oral History Association (OHA) has recently moved its national office to Georgia State University. The OHA offices will be based in GSU’s History Department and its executive director is GSU’s own Dr. Cliff Kuhn. This move marks an important opportunity for growth and development for the university, the association, and the field of oral history practice. In response to OHA’s move, a group of GSU faculty and staff have formed an informal oral history roundtable to bring together departments across campus to discuss projects and issues, and to share scholarship and ideas related to the field. The first GSU oral history round table will take place January 25 from 12:00-1:00 on the 8th floor of Library South. Harvey Newman, professor in the Andrew Young School of Policy Studies, will present on efforts to document Ambassador Young’s legacy through oral history interviews with Young’s family, colleagues, and friends. This entry was posted in African American Studies, Communication, Education, English, For Faculty, For Graduate Students, For Students, History, Religious Studies, Sociology, Special Collections & Archives, Uncategorized, Women's, Gender, and Sexuality Studies. Bookmark the permalink.